Gensler designed the updated headquarters of creative software powerhouse Adobe, located in San Jose, California. Built in the ’90s, Adobe wanted an updated headquarters to match their present-day values, culture and workforce. Gensler’s extensive 162,600 s.f. 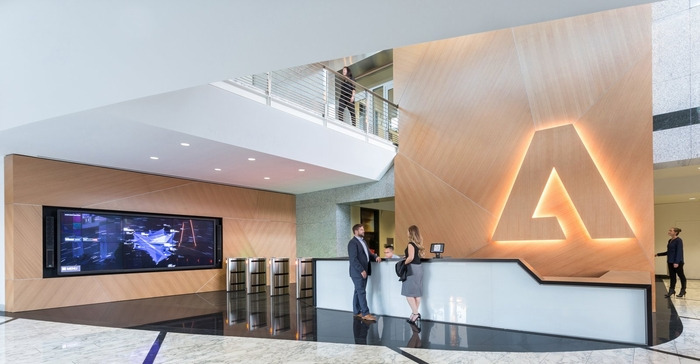 renovation connects and activates three isolated towers into a comprehensive vertical campus that transforms the everyday experience for employees and visitors alike. Updated spaces include two lobbies, a Customer Experience Center, Wellness Center, two cafés and work floors. The East and West Tower Lobbies, previously all-granite and marble, have been infused with warmth through the removal of the old materials and incorporation of wood and pops of color. The East Tower lobby, now the main campus entrance for visitors, is subtly branded with a dynamic backlit Adobe “A” and offers moments of both digital and tactile exploration. The West Tower lobby, a vibrant, open and expansive employee floor hosts a variety of spaces—oversized bleacher seating, the 350-seat Templates Café, “living room” areas and indoor/outdoor spaces—offering an inviting destination for casual interactions and alternative places to work. 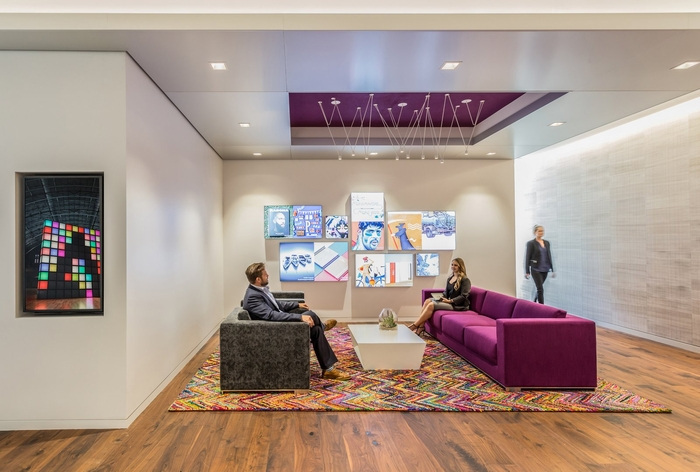 The Customer Experience Center (CEC), a briefing center that hosts potential and existing clients, VP’s and Executives, is set apart from the typical CEC with high-end finishes including, millwork, metal accents and wood flooring juxtaposed with bright colors, geometric shapes and Adobe interactive digital software throughout. The West Tower work floors were redesigned to dramatically change employees everyday experience. 100% enclosed offices with small breakrooms were replaced with an open floorplan layout with a variety of communal areas and alternative work spaces that draw people together and inspire creative thinking. Amenity spaces include two cafés and a Wellness Center. Off the East Tower lobby, the 100-seat Layers Café is a sandwich shop/coffee bar offering a “local” feel supporting socializing and work. Employees love working from Layers so much that they have started using the acronym WFL, Working from Layers. Upstairs, Palettes Café, a 250-seat dining area, offers fresh, organic food in a setting inspired by the farm-to-fork movement. Special elements include a succulent wall, greenhouse meeting rooms, and outside seating. The custom rooftop trellis turns a rarely used outdoor seating area into a usable and inviting area for eating, lounging or working. The Wellness Center supports overall well-being in a spa-like setting with spaces for both physical fitness and mental restoration. The Wellness Center has seen employee use increase by 25%. 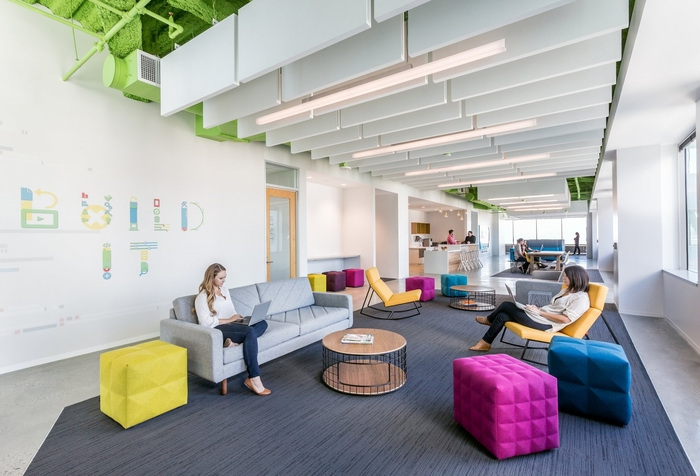 Adobe’s renovated headquarters is the company’s brand manifested, bringing new life to the headquarters, empowering employees to create their best work and the embodiment of the next generation of the innovative workplace.